After swimming and riding a bike, skating is the next, most essential physical activity a child should learn to do. 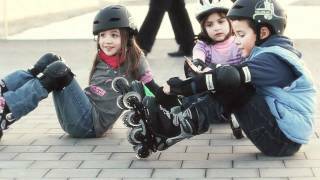 Skating is easily accessible, and a fun way to increase your child’s fitness levels and overall well-being. As a skater since the age of nine and a parent who coaxed her three children to skate the minute they could walk, I am probably a little biased. However, putting my high regard for skating and my pushy parenting aside, skating is one activity that can develop balance, coordination, strength, and boost confidence in children of all ages. Years of experience has shown me that once a child gets moving on skates, even one who is a bit apprehensive at first, the moving is most often accompanied by a smile because let’s face it, skating can be a lot of fun! Given the stiff competition physical activity is up against these days (Disney XD, Angry Birds, viral YouTube videos, etc. ), and the possible consequences of leading a sedentary lifestyle (childhood obesity, diabetes, joint and mobility issues), it is important for parents to find activities that will keep their child moving, smiling, and healthy throughout their childhood years. And when it comes to staying active, it is really important to keep “fun” in mind. While it is never too late to start skating, there is an optimal period of time to introduce physical activities like skating to your children. According to Professor E. Michael Loovis, motor development specialist from Cleveland State University, parents need to recognize that their children experience “sensitive learning periods” during which time they are more likely to acquire and develop their skills. The period between late preschool and middle elementary school is an optimal time for efficient and effective learning to occur. As a parent, it is a good idea to expose your child to a variety of activities during these “sensitive learning periods” and nurture the activities that resonate with your child. From my personal experience as a skater, coach, and now skating parent, I have found that skating is one of those “the sooner, the better” kind of activities. Plus, it is hard to find something cuter than a 3 or 4 year old rolling down the street in a pair of skates! If you don’t believe me, check out this video of my youngest daughter Jade who had just turned 3 when this video was taken a few years ago. 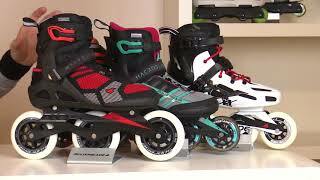 While the skating mechanics are very similar for all types of skating (inline, ice, and quad), inline skating is the most affordable and assessable for most families. 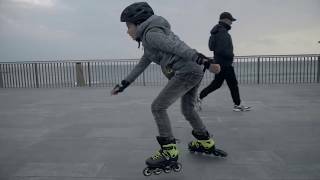 A pair of inline skates, protective gear, and a smooth surface away from traffic is all your child needs to make the most of his or her time on skates. 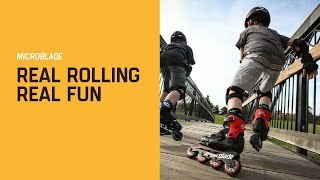 So if you are looking for a fantastic way to get your child plugged into fun, healthy lifestyle choices without breaking the bank, put some skates on their feet and watch them roll away. The smile won’t be far behind!